This is actually one of MY cats Bengie. Looking out of the window last week, I spotted him stalking this gorgeous little mouse near a rosemary bush. I grabbed the camera to see if I could get some good cat and mouse pictures and both Bengie the cat and the mouse posed beautifully for the camera! I took plenty of pictures of the play cat and mouse duo. This was the best cat and mouse photo of them all. They look so sweet don't they? The sad thing is that shortly after this photo was taken, my cat decided to have an early lunch! Bengie hit the mouse with his front paw and sadly broke his legs. But at least I have this lovely little cat and the mouse photo to remind me of both of them together. I've used the cat and mouse photo many times to create cards and photo wall calendars and friends and family always say this is one omy best cat pictures! Fantastic picture. 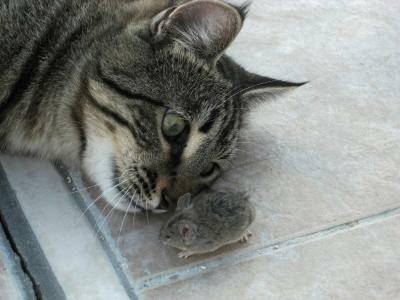 How on earth did you manage to stop the cat eating the mouse first? Join in and write your own page! It's easy to do. How? Simply click here to return to Show off your photos of cute Cyprus cats?.